Training for the High Five-0 Challenge is proving to be the perfect excuse for some long days nosing around in previously unexplored areas of the country. I’ve decided it was time I started sharing some of these wee adventures, so like or not, there will be a long series of these over the next 15 months. 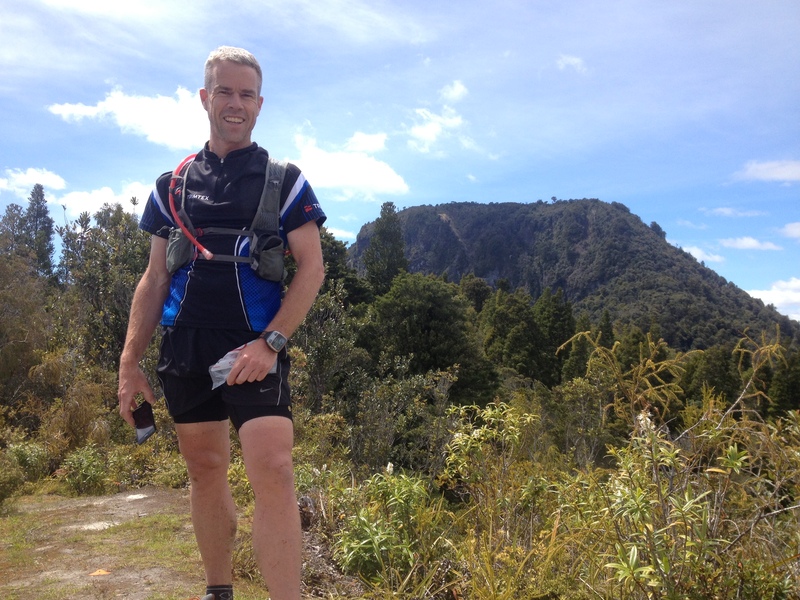 It was with good mate Steve Neary that I knocked off the RUDA (Ruapehu Up, Down & Around) back in April, and together we completed a partial traverse of the Kaimai Ranges, including the ascent of Te Aroha, a couple of months ago. Always a good keen man, Steve had agreed to join me for this latest recce into the Coromandel Ranges, checking out what I hoped would become Day 4 of the High Five-0. We rendezvoused in Thames early in the morning and drove our cars up the quiet Kauaeranga Valley, leaving the Running Wildmobile at the Wainora camp ground before driving Steve’s car back to the start of the Waiotahi Track on the outskirts of Thames. 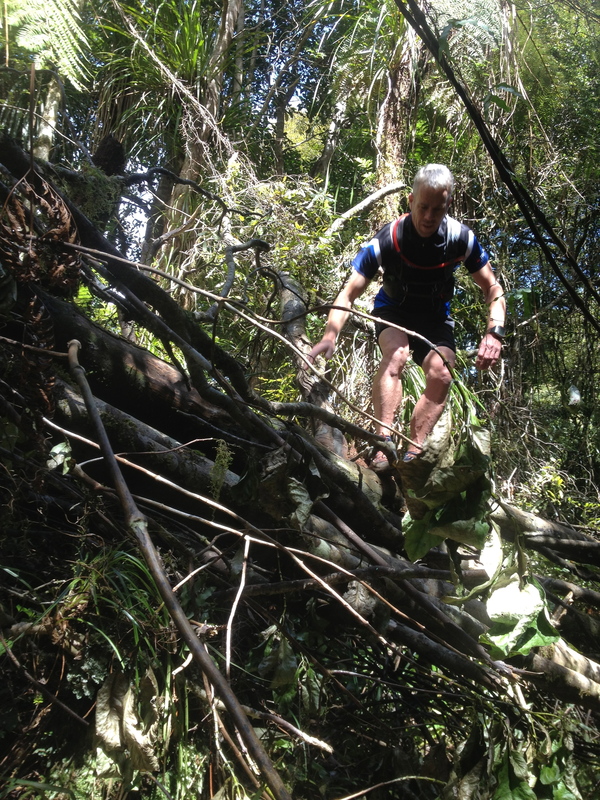 It was en route that I discovered I’d left the inner soles of my trusty Inov-8’s back in Auckland! Hmmm, not the best start to a long day on the trails! Setting off up a steady but well graded climb through regenerating bush, sneaking the odd peak of the Firth of Thames glistening ever further below us, we couldn’t help but wonder aloud how the day was going for all the unfortunate folk slogging it out in their city offices. The further we climbed the more beautiful our surroundings became, the morning light filtering through the canopy and landing in dappled patterns on the trail. We could have been the only people on the planet, such was the sense of peace and calm that engulfed us. For as far as the junction with the Karaka track the going was good, the trail pretty well groomed. But beyond this it started to get progressively rougher as we worked our way steadily north eastwards along the main ridge. Passing over the high point at about 660m we negotiated increasing amounts of windfall and washed out track, our ankles taking the brunt of this more technical style of running. I say running, but we were in no hurry, and as were fast walking sections. Eventually we bore off the main ridge, following the clearly marked trail towards the Wainora camp ground. Along the way we got our first close up views of the impressive Table Mountain, but this was the roughest section of trail yet, and progress was slow until we passed two giant kauri trees and hit the well graveled, stepped tourist trail up from the main valley. We piled down here, passing the first other people we’d seen in over 4 hours of running, and hit the camp ground just as our water supplies were running low. After a quick feed from supplies left in the Running Wildmobile (and the donning of a second pair of socks to take some of the burden from my inner sole deprived feet) we trotted up the gravel road towards the main car park. It was early afternoon and the day was warming up, ahead of us the big climb towards our main objective for the day – the spectacular Pinnacles. Emerging from the bush an hour up the trail the vista spread out before us, a smorgasbord for the eyes. 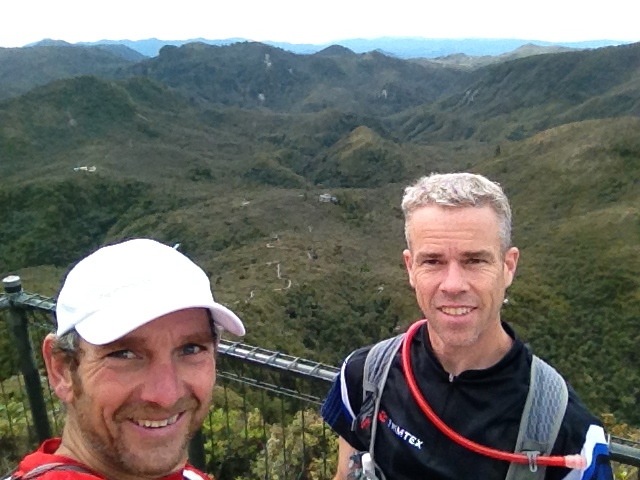 Stopping only briefly at the impressive Pinnacles Hut (Hotel?) 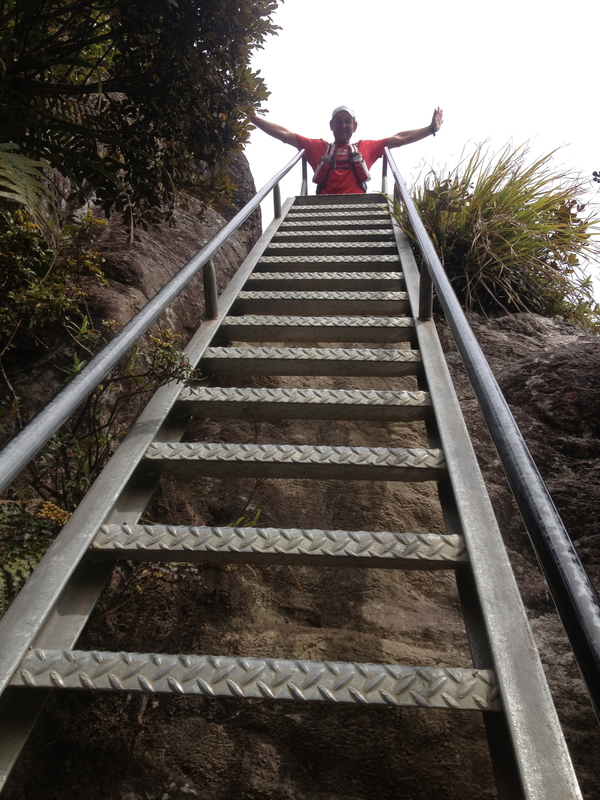 to top up on water, we pushed on up the staircases and ladders to the stunning summit itself. We’d been on the go for 6½ glorious hours and our efforts were rewarded with stunning views out to Tairua and the east coast in one direction, and a long way inland in every other direction. A thin layer of high cloud had moved in, sparing us from the sun’s full power, but a cold wind soon had us moving again. For a few kms we retraced our steps before turning off on to the Billy Goat Track, that offers a longer, more undulating, and much more rocky alternative route back into the main valley. By now our feet were feeling the affects of a long day on the trails and the rocky descent at times felt rather brutal. But with so much great scenery, especially the views down into the gorge where earlier in the year I had gone canyoning with my son, we couldn’t dwell on any discomfort we felt. Eventually the descent steepened down the old tramline track and we were refreshing our feet crossing the Kauaeranga River, with just a km of road to take us back to the car. Sitting in the stream 5 minutes after finishing, munching on a rare beef sandwich and knocking back an ice cold ginger beer, we reflected on our wonderful 8¾ hour adventure and agreed that this was definitely a day worthy of inclusion in the High Five-0. A real beauty! And here’s my Garmin Connect record of the day. 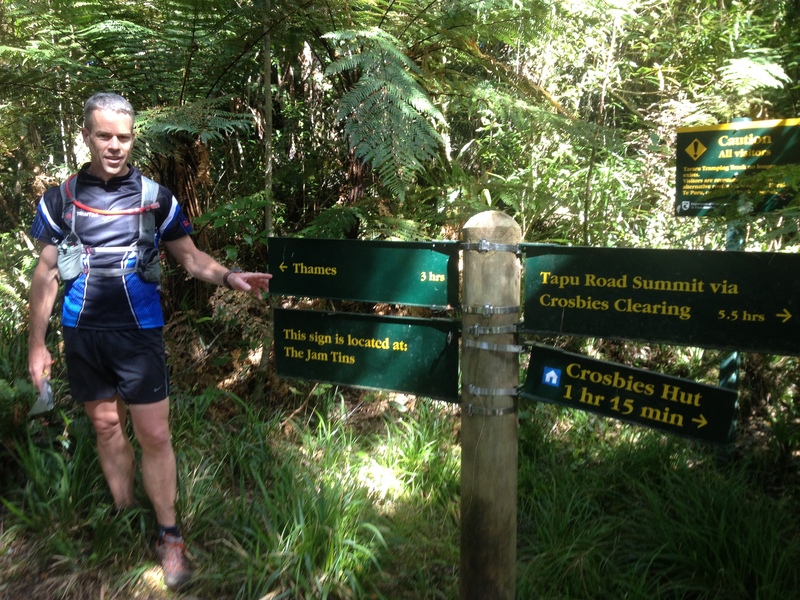 This entry was posted in Great runs and tagged Bush running, Coromandel, High Five-0, Mal Law, Steve Neary, The Pinnacles, trail running. Bookmark the permalink. inspiring. I’ll be reading these installments. Nice to see you experiencing some of the Surf 2 Firth Bush marathon track. The Kauaeranga is a great part of Godzone !